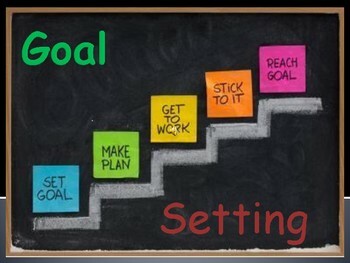 This goal setting activity addresses the following Language Arts Florida Standards for writing, speaking and listening, and language! This file is available as a traditional PDF file. All pages can be easily printed. LAFS.7.L.1.2 Demonstrate command of the conventions of Standard English capitalization, punctuation, and spelling when writing. This is a two day lesson. It can also be completed in one day if you allow the students to complete the assignment at home. 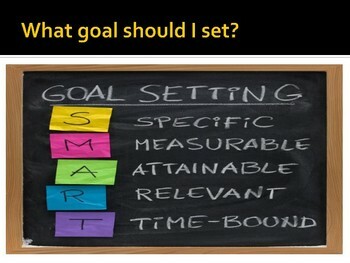 Step 2- Slide 5 remains frozen on the promeathean/smart board so students can see the example while they work. 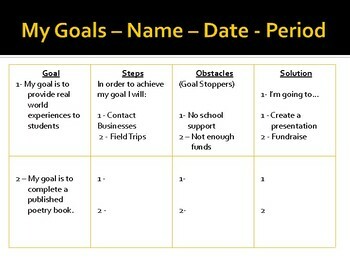 Step 3 – Give each student a copy of slide 6 (print ahead) so they may complete their own goals. The students really enjoy this activity! You can also have a motivational song playing in the background as you teach.